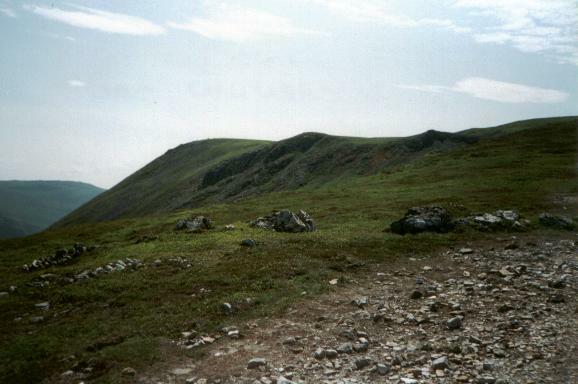 The Cairnwell and Carn Aosda are Scotland's two most accessible Munros. Combined with nearby Carn a'Gheoidh, they make an ideal introduction to the increasingly popular past-time of 'Munro-bagging' and on a clear day offer stunning views over the surrounding mountainous country. The Cairnwell and Carn Aosda sit within the Glenshee Ski Area, one of five ski centres in Scotland (the others are in the Cairngorms and Glencoe, at Aonach Mor near Fort William and the Lecht, Tomintoul). 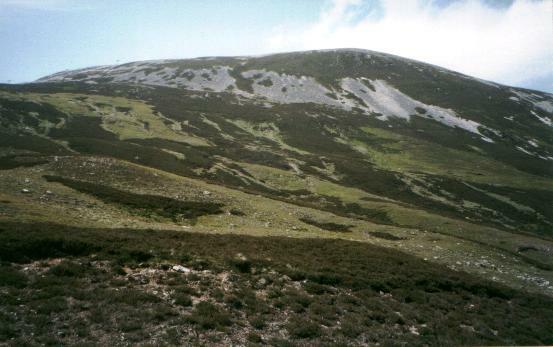 The steep slope down the east face of The Cairnwell is called the Tiger and is Glenshee's most challenging run. The run down from Carn Aosda is another good piste. The summit of The Cairnwell can be reached by chairlift but to take such a route to the top would surely be cheating. At any rate, the three peaks are easily conquered due to the high starting altitude. Leave the car in the ski centre car park, cross the main A93 road and pass along the front of the centre buildings. A track climbs steeply up behind them to a small round building at the base of a set of ski tows. A wide track rises north to the left of the Carn Aosda ski tow. The climb is strenuous but height is gained quickly and you soon find yourself atop the stony summit which is marked by a large cairn. The views north over the Grampian mountains are excellent and you can see for miles on a clear day. After you've caught your breath, head east down a track that runs around the top of another ski tow and down towards Loch Vrotachan. A muddy crossing takes the path over a small burn above the lochan and up on to the long north shoulder of The Cairnwell. After a short climb alongside a fence a small path strikes off to the right. This sets out through the heather and after negotiating a steep little dip, climbs up over a rocky knoll then runs along the crags towards Carn nan Sac, passing by two small lochans on the right. Wander out to a cairn at the end of the ridge for great views down to Spittal of Glenshee then take in the summit cairn. A flat open moorland plain leads to the base of a short climb up on to the rocky summit of the day's second Munro, Carn a' Gheoidh (translated from the Gaelic as 'hill of the goose'). From the top, retrace your steps back towards Carn nan Sac but before reaching this top, the path skirts left round to the two lochans and then makes its way back to the junction on the Cairnwell shoulder. The last ascent is fairly short but steep in places, particularly the final stretch from the top of the chairlift to the summit which is stony underfoot. Homeward bound now. Return to the chairlift station and follow the fence round the top of the coire for a short way until the slope below eases off then descend towards the ski tows and retrace your steps to the ski centre and car park. Start/parking Glenshee Ski Area car park. GR: 138781. Grading A relatively straightforward expedition suitable for fit and fairly experienced hillwalkers. During the winter the slopes hold the snow and are busy with skiers. The weather is frequently inhospitable and despite the relatively easy ascents involved, these are high mountains and require great care and the correct equipment. A chairlift runs to within 20 metres of The Cairnwell summit and operates during both the ski season and summer months.